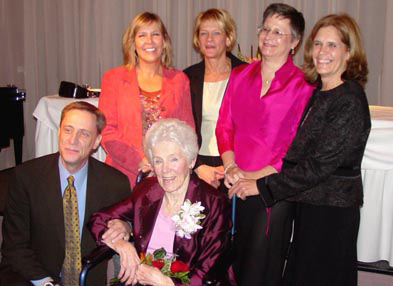 Margaret A. Paluch's two great personal commitments, her family and her church, shaped her life and guided her business. Mother of 9 and grandmother to 17, Margaret, better known as "Mickey", worked with her husband, Chester, head of the J.S. Paluch Co., Inc. J.S. Paluch, established in 1913 by Chester’s father, John S. Paluch, is a major national Catholic publisher of parish bulletins, worship aids and resources, inspirational music, and calendars. Following Chester's death in 1980, Mickey assumed leadership of the company and served as Chairman of the Board. Church vocations held a special place in Mickey's heart and became the primary focus of her service and generosity. She established the J.S. Paluch National Vocations Awareness Division in April 1985, committing substantial resources of the company to support vocation ministry, locally and nationally. Fully funded by J.S. Paluch, Co., Inc. and The Paluch Family Foundation, NVAD has held an Annual Vocation Seminar since 1988. Mickey established the Paluch Family Foundation in 1995 to support liturgy, stewardship, and vocations projects. The Paluch Family Foundation Annual Recognition Dinner honors award recipients chosen for their witness to the gospel and service to the Church and their community.